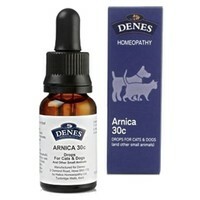 Denes Arnica 30C Drops for Cats and Dogs is a homeopathic method of supporting an injury - accidental or otherwise. Suitable for use in any situation from minor sprains and strains to helping with serious traumatic injuries, Denes Arnica helps prevent bruising, limits bleeding, encourages healing and reduces pain and the effects of shock. Arnica 30C is especially useful for dogs that have been over exercised or are just exhausted. It can also be used to assist in the recovery from strokes and help revive new-born puppies or kittens.